BinaryOptionsStrategies.net is a website specialized in delivering information about all aspects of online options trading. Using online trading platforms quickly have become one of the most interesting ways of trading, and almost anyone can do it. One of the main benefits of using these trading platforms is that it can take place anytime, anywhere, as long as the trader has a reliable internet connection and appropriate device. The Binaryoptionsstratehy.net team understands that traders, both experienced ones and complete beginners, can find it very difficult to navigate which is why we’ve made this website. The industry of binary options have changed a lot during the years – and actually the term binary options itself is now outdated. There has been a lot of fraud going on in the industry and we at Binaryoptionsstrategy.net have taken the consequensce and cut down massively in the platforms that we promote. In fact we want you to be so careful that we’ve cut down our brokers list to 2: IQ Option and Nadex. These are they only platforms we believe you as an online trader should be using. We are currently working on updating all our content – there might still be texts promoting other brokers, but you’ll find no promotion links or anything else that will connect us to benefiting financially from other platforms than IQ Option and Nadex. Are Regulated Brokers a Better Choice? Many traders are wondering what is the main difference between regulated and unregulated brokers. Well, to put it simply, regulated binary brokers have licenses that enable them to legally offer their trading services and operate in the regulated environment. They have to meet certain obligations before they even get a license, and in order to keep it they must respect a whole set of regulatory rules. Some of the financial regulators are CySec in Cyprus, FCA in the UK, AMF in France and BaFin in Germany. Regulated brokers are usually considered to be more reliable than unregulated brokers as they must follow numerous procedures and their customers have a higher level of protection. Unregulated brokers can do as they like, which means that traders accept much higher risk while trading with them. This can be not only less profitable but also dangerous, especially for beginners who don’t comprehend what a scam looks like. Binary options scams are common phenomenons in the industry. As always when something becomes increasingly popular, certain scams appear. Binary options scam brokers are very dangerous as they can take your money away, without you even placing a trade. They make false promises, avoid straightforward answers, and are often forcing the trader to deposit more and more. Also, it is not unusual for scam binary brokers to simply disappear with traders’ money. As they are usually not regulated, it is impossible to trade where the money went. They also use different tactics to cover their trail and often pop up with a different name, but with same scam approach. For this reason, we always advise traders to be careful and trade only with solid brokers that own a license. This will protect them in long-term even though they might not experience alluring promises about 100% win ratio and incredibly high payouts. Binaryoptionsstrategy.net – at this point – only recommend traders to use either Nadex or IQ Option. Read more below. When it comes to binary options trading in the United States, traders must know that it is somewhat different than in the rest of the world. The only way that US citizens can trade binary options legally is via binary options exchanges that are regulated by the CFTC. One of the best financial brokers in the US (or better to say, exchange) is NADEX. 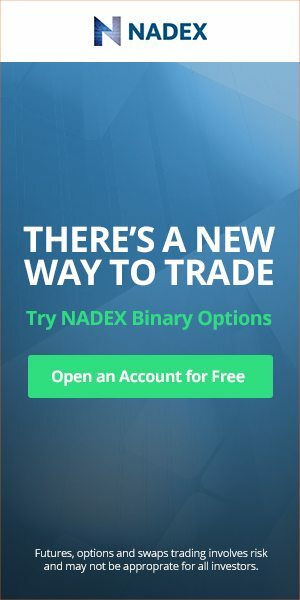 NADEX is an interesting binary options exchange that is very popular among the US binary trades but accepts non-us clients as well. Before traders decide to make a deposit, they can simply open a free NADEX demo that is completely independent of the real trading account and use it as long as they like. Opening the real trading account is not a condition to get a free NADEX demo like it is with many other binary brokers. Also, traders can easily go back to their demo even when they start trading with real money as it has no expiration date. In case they forget the login data, they can retrieve their password or simply open a new NADEX demo account. Read full NADEX review. What Makes a Good Binary Options Broker? Good binary options brokers, besides being regulated also have numerous benefits that traders can use to advance in their binary trading career. For example, good binary brokers have reasonable investment and deposit limits, as well as deposit-free demo trading account. Solid binary brokers also have an educational section that provides the trader with plentiful of information regarding trading and have professional customer support. Finding a good broker can be hard, but it is not impossible, especially if the trader puts some effort. IQ option claims to be one of the best and most popular choices among binary options brokers. On their website, they promise to provide the best trading experience and claim to have won numerous awards. Also, they say they are the broker you can trust. But before you believe all the advertising materials, it is important to understand how trading takes place with this broker. IQ option is a regulated broker that allows minimum deposit in the amount of only $10. This makes it very user-friendly as the average amount required for deposit is $250. In combination with these low requirements, you can also get a free demo account. Most other brokers only their demos to customers of their regular trading accounts, which means that you have to get a fully funded account in order to access the demo. In the process, you have to deposit an amount at least equal to the broker’s minimum deposit requirement, which in the case of IQ Option is only $10. Other brokers allow demo account only when the trader deposits enough to open some sort of premium or VIP account. This is one of the reasons we don’t recommend such brokers. A demo account works just like a regular trading account but allows you to invest play money instead of real money. In this risk-free environment, you can test your trading skills and develop strategies without having to worry about losing money or going broke. The money on the demo account is virtual, and so are the losses, but unfortunately the profit as well. However, a good demo can help you achieve better money management. First of all using the demo is a lot of fun – and perhaps you’ll come out more trained, secure and bold on the other side. Depending on the binary options signals provider, it can also deliver information about the binary broker and investment amount. Binary signals can be seen as a notice with all most important information that can influence the trader’s decision to take action and trade. In the past, binary trading signals were mostly generated by market experts or people who claimed to be highly educated in that field. Of course, not all so-called experts were really market specialists which meant high risk for traders. Sometimes it was impossible to prove whether or not someone really understands the market. Also, binary trading signals were very expensive. The price would go even as high as $100 for one month of binary signals. It was simply a service that was impossible for beginners to afford. It is important to understand how signals and trades were delivered on two different platforms, so after receiving a signal, the trader had to log in with the binary broker and then copy the data and finally, place the trade. Nowadays, signals are mostly based on binary algorithms that are scanning the market in search of a trade. This means that risk of human mistake is reduced. Also, the prices are now much lower and most binary signals providers are completely free. Modern binary options signals providers are cooperating the brokers and are allowing traders to place trades immediately with the broker on the binary signals platform. This takes binary trading to a whole new level! BinaryOptionsStrategy.net is a website that has focus primarily on trading strategies. Binary trading strategies are important as they help traders understand the trading process better. That is why we prepared a whole section dedicated exclusively to strategies. That is where traders can increase their knowledge, and also find some useful information. When it comes to trading strategies, it is very important to understand that not all strategies are created equal. Some are better for currency trading, others for stocks. There are binary trading strategies for beginners and strategies for advanced traders who have vast knowledge and experience. Of course, there are more complicated strategies and strategies that are more simple and easily applicable. Traders should carefully select their trading strategy and implement it to their trading plan. The trading plan can be a document or your personal strategy about how certain trading moves will be executed and within which timeframes. Also, the trading plan has to be realistic and applicable to day-to-day trading. This will also help you better control all the emotions that might show up during the trading process. But that is not where their job ends. No matter whether you use binary trading software, binary signals provider or regulated binary options broker, you should revise your trading plan periodically. This will help you adjust you your trading style and strategies? How were things going for you in the past? Is there a place for improvement? Only by revising your trading strategies and trading moves can you discover some new opportunities you maybe haven’t seen before. Only by having a solid and realistic plan can you manage the risk and trading opportunities. Also, the plan doesn’t mean anything without you using it. Don’t rely on luck, as that is what gamblers do, and that can be like a death sentence to your binary trading career. Be focused, have a plan and avoid not only scams but also be aware of human greed and everything it brings for traders like you. Unfortunately, in most cases, it brings only poor trading results that can cause a lot of stress and harm. This section is outdated. The text below has been preserved for historical/explicatorical reasons only. All outgoing links have been removed. Many people who have no previous experience in financial trading believe that binary options are a mere guess, something like a bet. However, it is important to understand that binary options trading, even though has more user-friendly approach is not betting, and should not be considered as such. Binary trading requires studious approach and safe binary options broker, as well as constant education and personal progress. What are binary options types? How to select a good broker? What is the importance of the free demo? Binary options are a special type of online trading. The trader never has to actually buy the underlying asset but places the trade based on the predicted direction of the price movement of the underlying asset. This makes them more accessible to people who don’t have large funds at their disposal or great knowledge in trading. Binary options democratized the world of financial trading and made it accessible to everyone with an internet connection. Also, binary options are more fast-paced than traditional forms of trading which make them more exciting. The deposit amount that goes over thousands and thousands of dollar in traditional forms of trading, is usually around $250 with binary options brokers. There are even some brokers such as IQ option that offer trading starting with $10 deposit. Many traders get surprised when they realize there are several binary options types available for them to trade. Understanding each of the most popular types can help you create a better trading plan. High/low – also known as put/call or up/down options, are the most common and popular binary options type. They are the simplest type to trade as you only have to decide on the price movement in the expiry time offered. Turbo options – known also as 60 seconds trading. They can be traded in shorter expiry times as well, but 60 seconds is most frequent one. One touch – binary options where predicted price can be reached at any point until the expiration time runs out in order to be profitable. For example, if the trader places one touch trade with an expiry time of 1 hour, and the price is reached in the 59th minute, the trade is profitable. No touch options are the opposite. Boundary binary options – where trader predicts that the price will move between determined levels in a certain time frame. Ladders – when trader predicts several levels of price movement in a certain time frame. Long term – trading with longer expiry times. Pairs – trading assets in pairs that are correlated. Traders are basically predicting the relative performance of, for example, two stocks. As competition is very harsh among binary options brokers it is not surprising that many brokers create and offer additional binary options types to make trading even more interesting and dynamic. This means that traders have a great selection of trades, especially considering that often they are the ones who combine assets, expiry times and binary options types. The expiry time is an important element of all binary options types. To simplify it, we could say that it is a duration of the trade. After the trader makes a prediction about the price movement of the underlying asset, there is a certain timeframe in which the change has to occur. Depending on the price in the moment expiry, the trader will either win or lose the trade. One of the main reasons expiry times are so important in binary options trading is that they often determine, or at least influence, binary trading strategy. How to select a Good Binary Broker? Binary options trading is impossible without a binary options broker. With so many brokers around it is only logical for beginners to get lost or at least slightly confused. New brokers pop up every day, but wise traders take their time to make a good and reasonable decision when selecting their broker. Even though there is no universally great broker that will satisfy every trader, there are still some characteristics that distinguish good brokers from bad brokers. Always read terms and conditions before making a deposit. Yes, we are bombarded by T&C documents all over the place, but if you want to trade binary options make sure to read it. This is a document that defines relationship, rights, and obligations of both you and the broker. Don’t neglect it. Look for a broker who has all necessary licenses and regulated status. Don’t’ just trust their word, make sure to check the information they provide you. Binary options trading contains risk, but be sure that the risk is even higher when trading with unregulated brokers who can add bonuses and change their T&C as they like, leaving you in a vulnerable position. Imagine a platform that freezes every time you have to place a trade, or that is so complicated you don’t even know where to start. Binary options trading should take place on technically reliable platforms that operate flawlessly. Look for a platform that provides a good overview and has multiple tools you can use while implementing binary options strategies to your daily trading. Good brokers also offer reliable mobile apps that can be used anytime and anyplace, and that have been created with modern traders in mind. All they need to do is log in and they can trade wherever and whenever they like! All traders, but especially beginners should focus on finding a broker with a good demo account. Advanced traders can use such account to improve their strategies and test them before using them on a real account, and beginners can discover the world of binary options trading to the fullest. This means that they get an opportunity to trade with virtual money first, which will help them understand the entire binary trading process. Why is free binary trading demo important? Of course, trading with virtual money means that all profit, but also all risk is virtual. However, it is still the best educational tool a binary broker can provide to its users. Of course, not all demo accounts are the same, so we highly recommend to traders to look for free demo accounts where they can test the binary broker before making a deposit. Some brokers provide traders with a demo account only after they make a deposit, but if they look carefully they can find binary options demo accounts that are completely free. Such accounts are offered by NADEX (for US binary trading) and IQ option. By allowing you to sign up for their demo as a stand-alone account without having to get a regular trading account, these brokers allow you to get a fully functioning high-quality demo without having to risk any money. The free trading demo allows traders to test platform risk-free, which can be of crucial importance. If the demo has an unlimited expiration date, it also gives the trader the opportunity to come back whenever he needs and test his trading in a virtual environment based on real facts.